My dad is a part-time herbalist, a position that was passed down in the family. Family and friends often ask him to prescribe herbal medicine to help relieve certain ailment. He makes herbal medicine in all forms such as powder, liquid, dough, etc; I just know they all taste god awful. It's basically ground dried roots, plants, and tree barks how can you expect it to taste any good. He always assured us that it was good for us, they are nature's medicine. I try to stay clear of his herbal medicine except for one exception, when I want to make Che Sam Bo Luong. Sam Bo Luong is a sweet soup of Chinese origin. 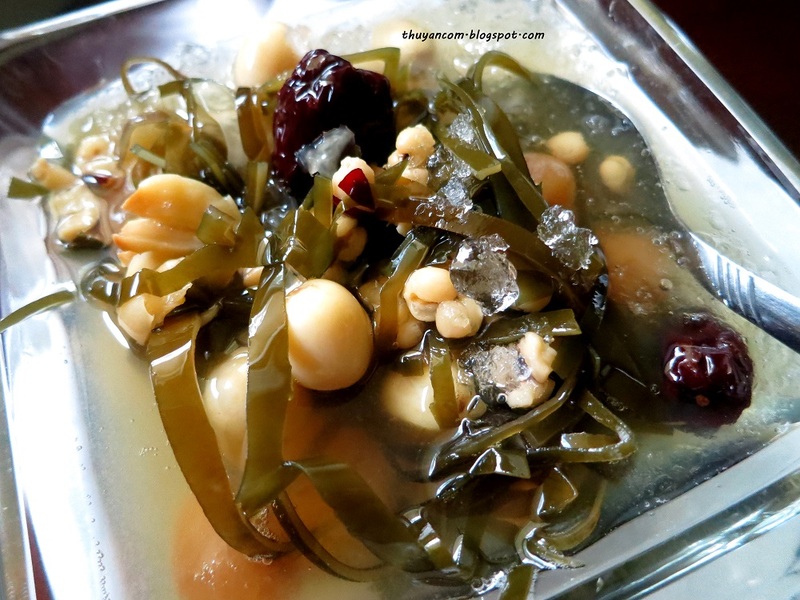 Ingredients for this sweet soup varies but jujube(Chinese dried dates), dried logan, seaweed(kelp), white fungus, pearl barley, and lotus seeds are the usual suspects. Each of these ingredients have a medicinal usage therefore this dessert is often deemed as good for your health. My dad says every ingredient has either a "cooling" or "burning" effect to your body, like a ying yang effect. Therefore it is important that we consume both kinds of food to attain a balance. I'm glad this soup is considered good for you because it is delicious. On a hot summer day, you simply cannot get enough of this dessert! You may have trouble finding certain ingredients especially if you only have access to a smaller Asian grocery store. We have had some trouble finding pearl barley at the market but my dad usually have a lot in stock from the herbal shop. 1. You'll need to rinse and rehydrate most the ingredients except the dried dates and dried logans. The kelp will require a lot of rinsing because it may contain a lot of sand/dirt. You can soak the dried ingredients overnight or boil them for instant use. 2. Soak the kelp in warm water after a good amount of rinsing and then cut them up into 3 inch ribbons. Soak the white fungus in a warm water and chop them into smaller pieces. 3. Boil the lotus and barley to soften it up but you don't want to cook them all the way through. About 10-15 minutes in boiling water will do. 4. Fill a 10 qt. pot with water and add 2-3 cups of brown sugar. You can add more or less sugar to your liking. 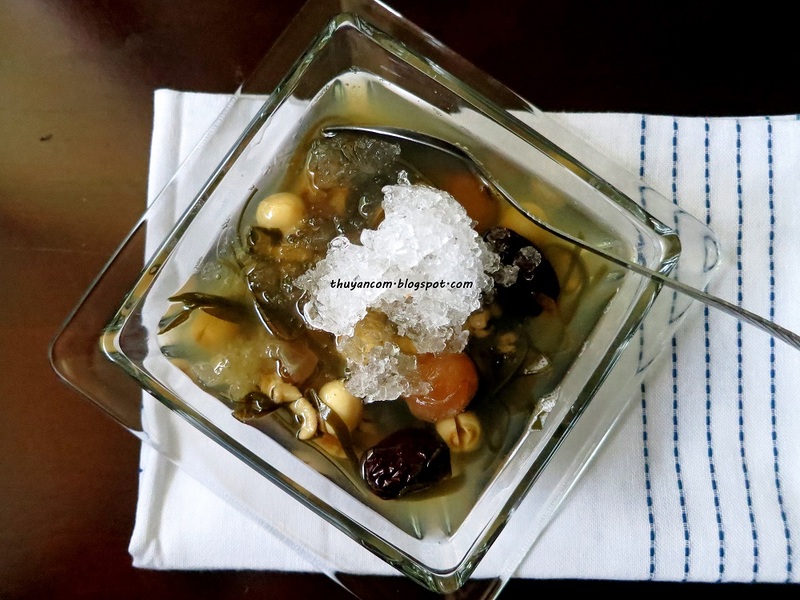 This is suppose to be sweet soup after all so it is usually made very sweet and eaten with crushed iced. 5. Once the water has come to a boil, add the barley, lotus seeds, and kelp. Let that cook until tender. 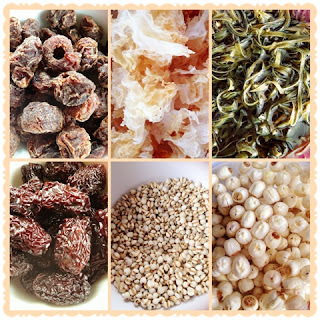 Then add the white fungus, dried dates, and dried logan. 6. Once you attain the sweetness to your liking and all the ingredients has become tender, you can turn off the heat. 7. This sweet soup taste best when chilled or eaten with ice. Enjoy!